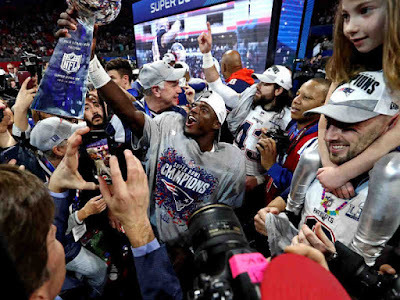 ATLANTA, LELEMUKU.COM - The New England Patriots defeated the Los Angeles Rams 13-3 in Sunday's Super Bowl in Atlanta, capturing their third National Football League championship in the span of five years. For Patriots quarterback Tom Brady, the victory was his sixth in a Super Bowl, extending a record he already owned. The 41-year-old star has struck down talk that he might retire after having now played in his 19th NFL season, saying during the postgame trophy ceremony, "How could this not motivate you?" Both teams struggled to score throughout the game, with the Patriots holding a 3-0 lead at halftime and scoring the game's only touchdown with seven minutes remaining in the final quarter. Patriots wide receiver Julian Edelman was named the game's most valuable player after catching 10 passes for 141 yards. "He deserves it," Brady said. "That was one of the best games he ever played." For many, the commercials shown during breaks in the action are a bigger draw than the game itself. Many companies roll out new television ads created especially for the big game, and they pay big money to get those ads in front of viewers. This year a 30-second advertising spot cost more than $5 million, according to AdWeek. The halftime show is also another big draw for many people. This year the NFL had some difficulty finding big-name performers for the show. Several performers, including Jay-Z, Cardi B and Rihanna, spurned the league's offer to appear at the event as a show of solidarity with Colin Kaepernick. Kaepernick is a black player who accused the NFL of conspiring to keep teams from signing him over his protests of racism and police brutality during the national anthem played before games.